Conversion tracking for websites enables you to measure your return on investment by tracking the actions users take after viewing or engaging with your ads on Twitter. Twitter’s conversion tracking lets you attribute conversions beyond last link click, to include actions driven by all types of ad engagements (like link clicks, Retweets, or likes) and impressions. 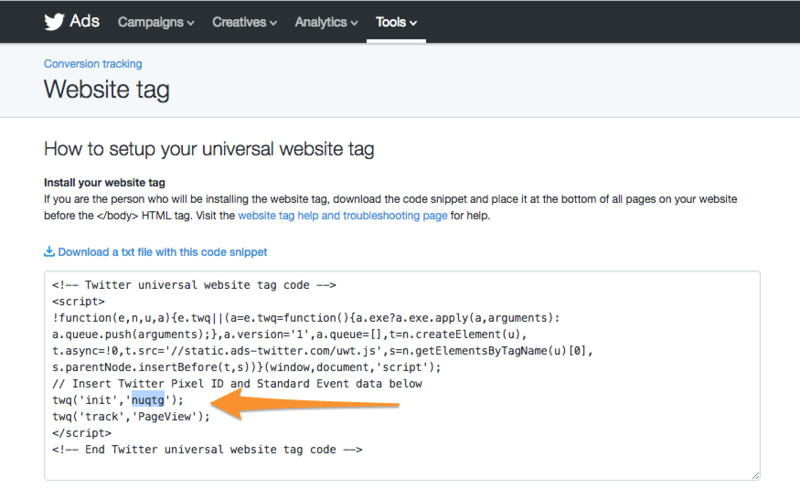 We support the Universal Website Tag which simplifies the tagging process so you can deploy one tag across all funnel stages of your site, with a simple parameter passed into the tag to signify the type of conversion you want to track. 1. The first step in setting up your campaign with Twitter Ads is to identify the conversion events you would like to track. A conversion event can be, for example, a home page visit, a purchase, a white paper download, an email newsletter signup, etc. Within the Twitter Ads UI ( https://ads.twitter.com/), log into your Ads account and set up your campaign. 2. Under conversion tracking, click “View code and installation instructions”. 3. Within the code snippet, copy your pixel ID from the line that resembles “twq(‘init’,‘twitter_pixel_id’);”. In the screenshot below, the pixel ID is ‘nuqtg’. Your pixel ID will be unique to your Ads account.